We all know to steer our pets clear of things like pesticides and antifreeze, but did you know that human foods are the most likely culprit of poisoning animals? Many websites can give you more information on what foods to avoid, and the ASPCA has an especially good section on poison control. We’ve listed some food items below to be extra careful with, as well as some suggestions for keeping pets safe from other potentially fatal substances. Everyone wants to enjoy the party, even our pets. Poisoning prevention is as easy as keeping an eye on your menu to be sure that your buddy won’t be getting a bellyache any time soon. Alcohol can be fatal to both dogs and cats, even in relatively small doses, so be sure to clean up any spilled drinks. Keep in mind, alcohol is often found in unexpected places, such as rum-soaked fruitcake or unbaked bread dough, so be wary of these items as well. Many folks don’t realize that dogs and cats are essentially lactose intolerant, so milk and dairy products can lead to stomach upset and diarrhea. Coke or Pepsi? Neither! Caffeine is poisonous to both dogs and cats. Ingestion of caffeinated drinks, including coffee, tea, and soft drinks can be fatal and there is no antidote. So, if you’re having a drink and your furry friend strolls up, be sure to lead it to a fresh bowl of water instead. Watch out for menu items that contain garlic, onion, and chives. Yes, these are tasty for you but according to WebMD, they are a big NO-NO. These can cause gastrointestinal irritation and red blood cell problems that could lead to anemia. Avocados contain Persin which can be toxic for many animals, including dogs, cats, birds, and rabbits, so be sure to keep your guacamole to yourself. Avoid giving your pet salty snacks, including chips and pretzels. Large amounts of salt can cause excessive thirst and urination, or even sodium poisoning in animals. 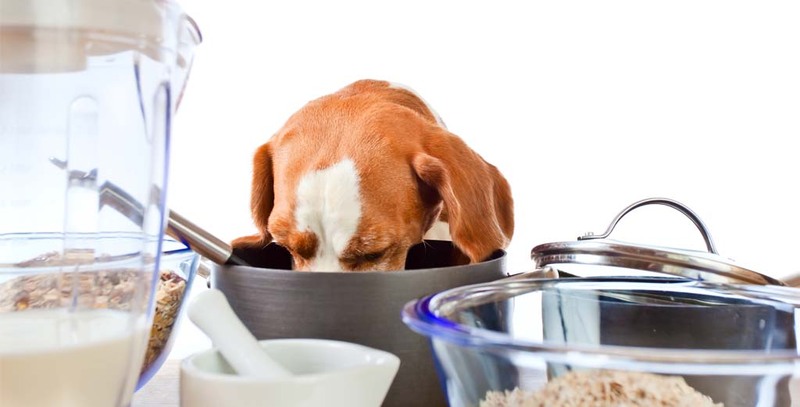 Slipping your pet a taste of the main course while you are preparing it or eating it might not be the treat you had in mind. While cooking, remember that raw food, meat, and eggs can cause food poisoning for animals just like they can for you. Don’t be tempted to drop a bone or piece of skin under the table while you are eating. Cooked or raw skin can cause pancreatitis. And, contrary to popular belief, dogs can choke on bones. Many of the bones can also splinter, which can create hazards in the digestive tract. Other ingredients that may be in the meal, including mushrooms and mustard seeds are poisonous to animals. While that chocolate cake or oatmeal raisin cookie may taste great to you, it can be toxic for your pet. Never, ever give a dog or cat chocolate. While it might be your favorite treat, it is one of the worst for them. As PetWeb MD explains, it contains a toxic agent called theobromine that can cause vomiting and diarrhea, seizures and even death. Consequences include painful stomach issues, tremors and kidney failure. In the larger fruits, the seeds/pits can also cause issues such as internal obstructions. Many sweet treats might contain xylitol, an artificial sweetener which is toxic to pets. It can cause liver failure, which can be fatal. Keep in mind that excessive amounts of sugar can contribute to obesity in pets, just as it can in humans, and avoid feeding pets sugary snacks–even those that are free of poisonous ingredients. Some foods that may be edible to dogs can cause problems with cats as they have different metabolisms. Of particular danger to cats is baby food, which often contains onion powders. Baby food also lacks vital nutrients that cats need in order to be healthy. In addition, many people think it’s ok to feed their cats tuna and other fish. This is not true. Feeding your cat large amounts of any fish can lead to a thiamine (Vitamin B) deficiency, which can cause loss of appetite, seizures, and in severe cases, death. Pet foods are specifically formulated to meet the nutritional needs of a certain type of animal, so make sure that dogs only eat dog food and cats only eat cat food. For a more complete list of specific foods to avoid feeding your cat, check out this article by PetEducation. Many common household items are poisonous to pets. Medications meant for humans, cleaning products, insecticides, rodent poisons, auto-care liquids, and nicotine are all toxic hazards to animals. The American Humane Association suggests taking the same precautions when poison-proofing your home for your pet as you would for a child. Never give pets medications, vitamins, or nutritional supplements meant for humans. Even over the counter medicines such as aspirin and acetaminophen can cause dangerous health problems such as internal bleeding in animals. Store all medicines in a secure area where pets cannot get to them, and be sure to keep containers tightly closed. Only administer medications prescribed by your veterinarian. Cats are often attracted to unusual flavors, so keep them away from diaper rash ointments, calamine lotion, and sunblock. Keep pets away from tobacco products and nicotine replacement products. Nicotine is a stimulant that can increase the heart rate, leading to collapse or even death in animals. Store cleaning products in high, closed cabinets, and avoid storing anything below counter-level, as these products can be lethal to pets. Take similar precautions in the garage, and store pesticides, antifreeze, and any other chemicals high off the ground. Pay close attention to labeling, as flea control products are specifically labeled for dogs or cats. This is because the agents used for dogs are not safe for cats. If your pet accidentally ingests anything listed above, or anything else you know as poisonous and starts showing signs of trouble, be sure to contact your veterinarian right away for advice. You can also call the ASPCA’s animal poison control hotline at (888) 426-4435. For easy reference, download and/or print our Emergency Pet First Aid infographic as well. Taking precautions to ensure that your pet’s food and treats are appropriate for them, and storing poisonous substances out of their reach, can help keep your pet safe, healthy, and the life of the party.